At 9 .am., Viejas will try to set the record for the largest deck of cards as six players participate in the DreamCatcher lounge at the world’s largest blackjack table. Each player will be provided with a $1,000 buy-in ; all the money won will be pooled and go to Operation Homefront in San Diego, benefitting our veterans. 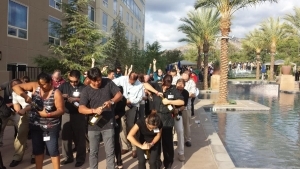 At 6 p.m., a spirited crowd at the poolside patio at Viejas Hotel will attempt to open the most bottles of wine opened simultaneously in under 30 seconds. View a video of a previous record set at the Bellagio in Las Vegas: http://www.guinnessworldrecords.com/news/2012/3/wine-bottle-opening-world-record-gets-popped-in-las-vegas). Photo above: Practice wine-opening session at Viejas in late August.